The Sonics only had three competitions on Saturday, but they made the most of it by going three-for-three in the medals. Anthony Chatman got things started off right for the Sonics with his 8th place finish in the 11 Boys Discus. The 9-10 Girls 4×100 relay followed it up with their 8th place finish in the finals. And capping things off in big way was Octavia Gee who not only won the 10 Girls Turbo Javelin, but set a new national record in the process with a toss of 86′ 8″. This brings the Sonics’ medal total for the Junior Olympics to EIGHT! This is a remarkable accomplishment considering we had our smallest team in years. Congratulations to everyone for their hard work and determination! Sonics medal #5 came early in the day with Damario Gee‘s 4th place finish in the 11 Boys Turbo Javelin. Anthony Chatman, competing in the same event, had a strong 13th place finish with a PR throw of his own. In the 4×100 relays, the 9-10 girls, Olivia Nicholas, Kylah Woods, Jayla Cooper, and Octavia Gee recorded the fifth fastest time in their division thus securing their spot in the finals on Saturday. The Sonics 8-under girls, 11-12 girls and 13-14 girls teams also competed, but failed to advance. Closing out the day were Amira Chatman whose PR performance in the 13 Girls Discus put her in 11th place and Jayla Cooper in the 10 Girls Long Jump and Aubrionna Hebert in the 17-18 Women’s Javelin. Today was a relatively quiet day for the Sonics. It started off with 1500 meter PR performances from Angela Mayer and Amelia Olowu in the 8-under Girls and 9 Girls divisions, respectively. Connor Parker then posted a top 15 finish in the 9 Boys 1500 meters. Siyon Rogers had a huge PR in the 9 Boys Turbo Javelin, beating his previous best by nearly 20 feet! 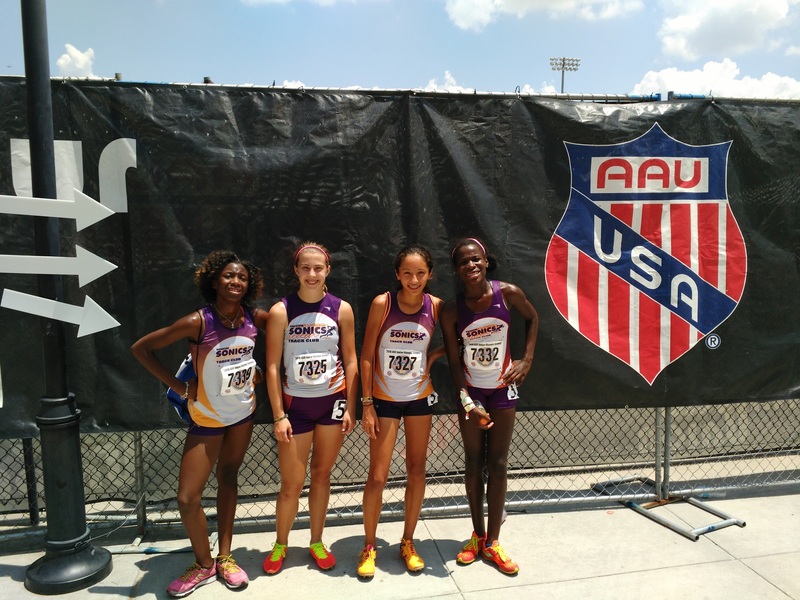 The day was wrapped up with 13-14 Girls 4×400 Relay who failed to advance to the finals. On Friday, the Sonics will be looking to contend in four relay events, five field events, and Cesley Williams in the 13 Girls 400 meter dash. Sonics medal #4 of the Junior Olympics was a bit unexpected and came early in the day from Jaiden Anderson in the 12 Girls Turbo Javelin. Despite not being seeded among the top 20 competitors, Jaiden made a huge improvement on her personal best with a throw of 75′ 0″ which was good enough for an 8th place finish! Amelia Olowu, Connor Parker, Todd Woods, and Michelle Mayer all competed in the 800 meters, Kennedy Burgess in the shot put and Kenneth Burgess in the turbo javelin and shot put, but none managed to reach the medal podium. Finally, the 11-12 girls had a solid showing in the 4×400 relay, but did not advance. Tuesday got off to a bang early with two more Sonics medalists. Michelle Mayer took 5th place finish in the 14 Girls 1500 meter run and then Octavia Gee followed it up with her second gold medal of the meet by winning the 10 Girls Shot Put. This is her third consecutive year of winning this event. The Sonics medal count for the meet now stands at three. 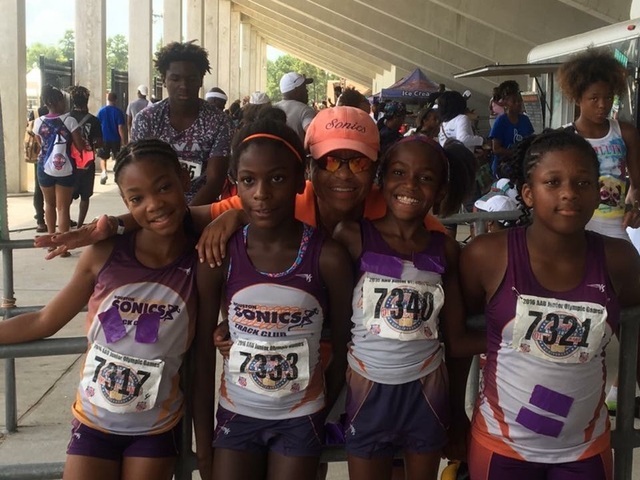 The Sonics were well represented in the 200 meter dash with Ryann Dedmon, Daniel Mitchell, Kylah Woods, Olivia Nicholas, and Hannah Nicholas, and in the 400 meter dash by Ryann Dedmon, Kylah Woods, Connor Parker, Todd Woods, and Nylah Raspberry. Unfortunately, none of them managed to advance in those events. Also competing in the field events were Kenneth Burgess in the Turbo Javelin, Alex Ewing in the Discus, and Anthony Chatman who had a strong 10th place showing in the 11 Boys Shot Put. Sonics only had four athletes competing today. Michelle Mayer finished 9th overall in the 14 Girls 800 meter prelims and will advance to the finals to be held on Wednesday. Mikayla Courville ran a season’s best time in the 15-16 Girls 400 meter hurdles, but did not qualify for the finals. Haley Bullington and Olivia Nicholas competed in the 15-16 Girls and 10 Girls high jump, respectively, but neither made it to the medal podium. Tomorrow will be a much busier day for the Sonics as 14 of our athletes will be competing. No Sonics athletes competed on Day 1, but Day 2 got off to a fantastic start with Octavia Gee taking the gold in the 10 Girls Triathlon! Her winning point total of 1176 was more than 100 points clear of the second place finisher. Let’s keep the momentum heading into week, Sonics! 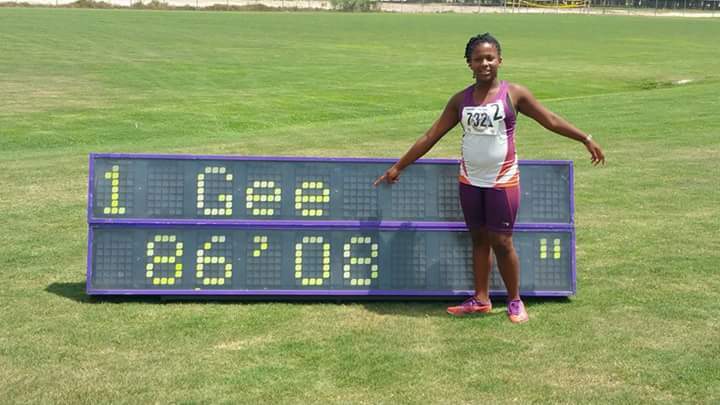 Breaking national records is nothing new for 9-year old Octavia Gee, but this time it appears she has her first WORLD age division record. Competing in the Texas vs. 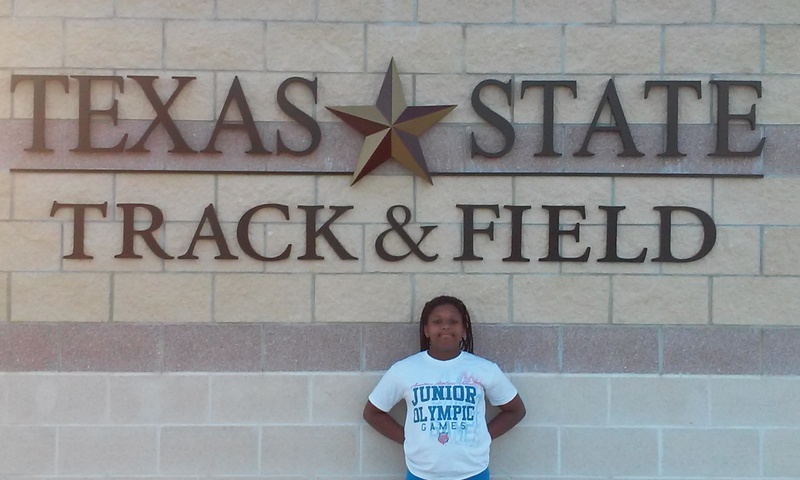 The World All-Comers meet in San Marcos, TX, Octavia has established a new mark in the 4-kg shot put for 9-year olds with a throw of 7.28 meters (23′ 10-1/2″). There was no pre-existing world record for 9-year olds using a shot of this much weight (in US competitions, this age division typically uses the 6-lb shot), but the European record for 10-year old girls is only 7.05 meters, so her performance has been deemed the de facto world record for 9-year old girls which should soon be published at this site. UPDATE: Here’s an excellent write-up on the story from the Sugar Land Sun. 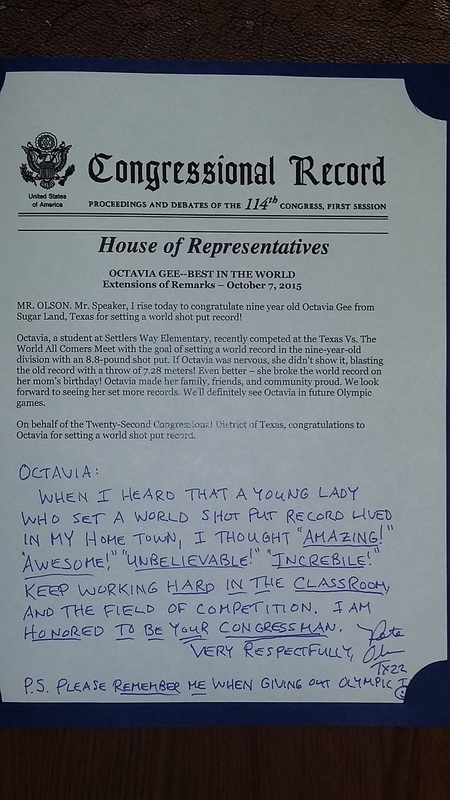 UPDATE 2: Texas District 22 Representative Pete Olson congratulates Octavia in a statement presented to the House of Representatives on Wednesday, October 7. 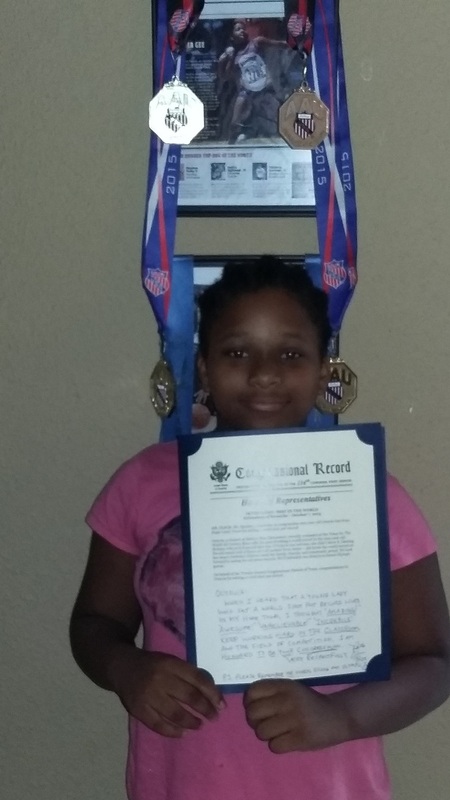 UPDATE 3: Photos of Octavia with the documents presented to her by Representative Olson. 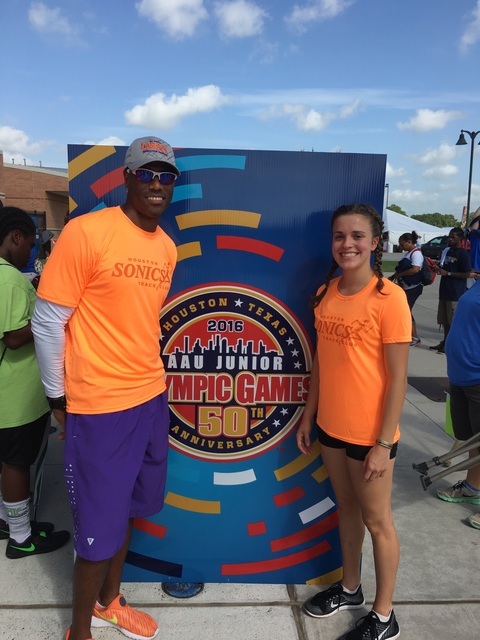 Octavia Gee garnered Sonics’ fourth medal of the 2015 Junior Olympics in dominating fashion in the 9 Girls Turbo Javelin event. She smashed the old record of 64′ 2″ with a massive throw of 80′ 3″! The action is underway in Norfolk and the Sonics are off to a very nice start. Octavia Gee picked up where she left off from last year by winning the gold medal in the 9 Girls Shot Put with a toss of 28′ 6-1/2″. Davon Beckles won a medal with his 6th place finish in the 12 Boys 3000 Meter Run. Anthony Chatman was our first competitor on Saturday and just narrowly missed a medal with this 9th place finish in the 1500 Meter Racewalk. Michelle Mayer also just missed advancing to the final in the 13 Girls 800 Meter Run with her 14th place time. Hannah Nicholas finished 27th out of 72 competitors in the 12 Girls Long Jump, Jonathan Cooper finished 33rd out of 83 in 10 Boys 100 Meter Dash, and Makenli Raspberry finished 60th out of 83 in the 15-16 Girls 800 Meter Run. Sonics young throwing phenom, Octavia Gee, has just been featured in the Sept-Oct 2014 edition of Youth Runner magazine for her remarkable run of record-breaking performances this past summer in the shot put and turbo javelin. Congratulations, Octavia! 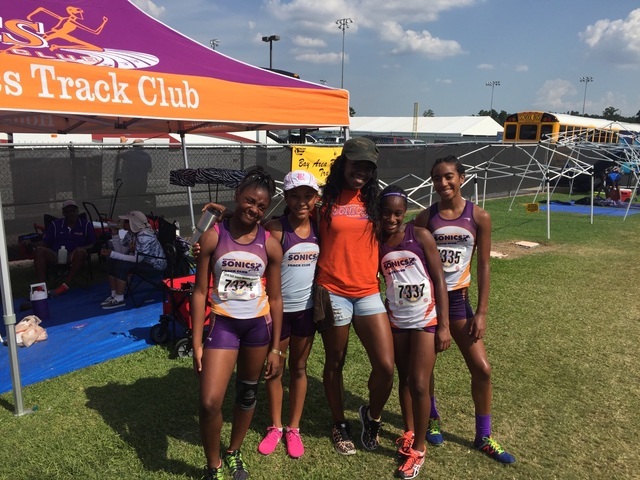 Highlights of the day for Friday were Octavia Gee’s 2nd place finish in the 8-Under girls turbo javelin with a throw of 64′ 8″ and the 9-10 girls 4×100 relay team earning their spot in Saturday’s final with the sixth fastest qualifying time of 57.95. The heartbreaker of the day was the 13-14 girls 4×100 relay team which just missed qualifying for the final by finishing in 9th place. The Sonics medal count now stands at six with a few more expected in relay finals on Saturday. 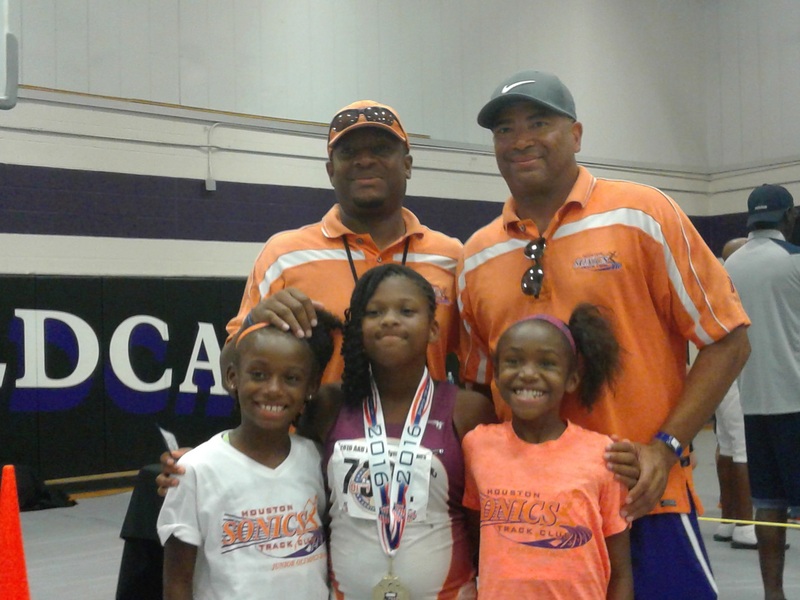 After breaking records at the AAU Primary Nationals and the USATF Junior Olympics, Octavia Gee hit the trifecta by setting the 8-under Girls Shot Put national record at the AAU Junior Olympics in Des Moines, IA. Her winning throw of 27′ 6.5″ beat the previous standard by an inch and a half. The final results are posted here. This was the Sonics’ second medal winning performance of the Games thus far. Octavia Gee continued her assault on the record books by demolishing the USATF national record in the 8-Under Girls Shot Put event. Her winning throw of 26′ 7-1/4″ bested the previous record by over two and a half feet! Final results of the event can be viewed here. 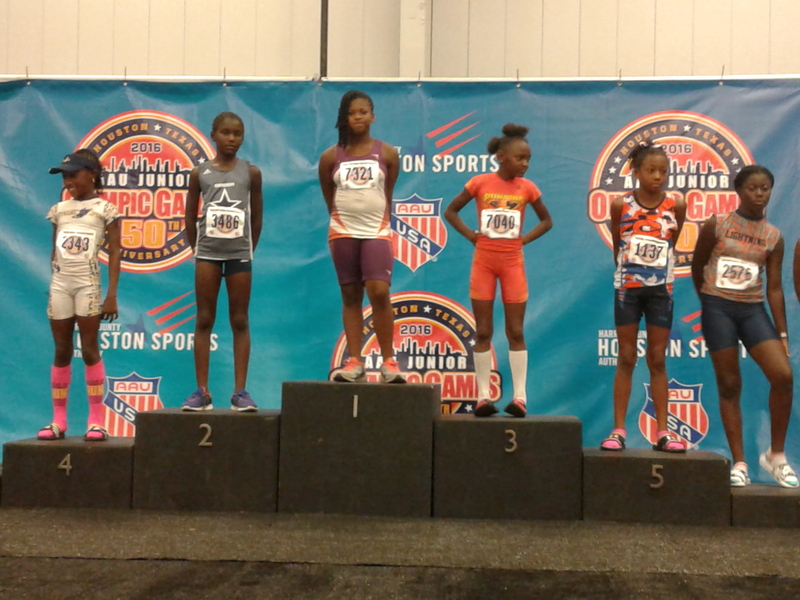 Octavia added to her growing list of national-level titles by winning the 8-Under Girls Turbo Javelin event at the USATF Junior Olympics held at Turner Stadium in Humble, TX. Her winning throw of 18.29 meters (60′ 0″) was a new personal best. Here are the official results from the event. 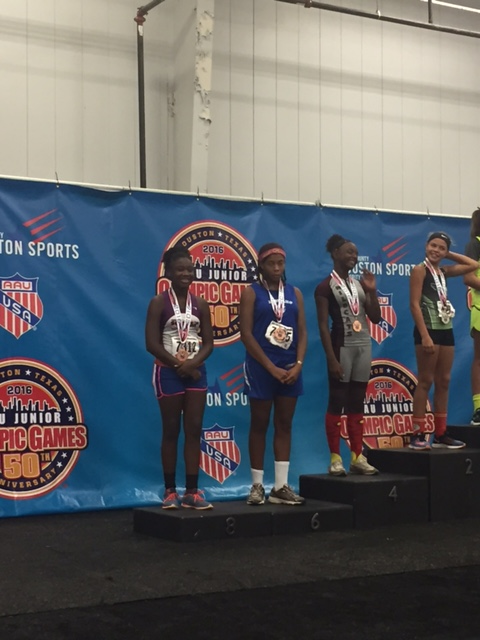 Octavia Gee added her third gold medal and second record performance at the AAU Primary Nationals, this time in the turbo javelin event. Her throw of 52′-7″ demolished the previous record 42′-4″ set last year. Not to be outdone, young Jayden Chargois set a record of his own in the 5-year old boys shot put. His winning throw of 11′-11″ crushed the last year’s record of 8′ 7-3/4″.